For many years I used dried herbs and spices in my cooking. In fact my spice cabinet is chock full of large and small containers of herbs and spices from the plastic, to glass, and even the rectangular metal containers. All these different styles of containers make it challenging to organize and find what I’m looking for. The other day, I needed some cinnamon as I was baking a cake. Usually the cinnamon is right in the front because I use it so often but this time it was buried in the back of my carousel organizer. As I searched through all my spices I realized – in the past 10 years I have made a significant switch from using dried herbs to using fresh. Many of the dried herbs I have probably need to be pitched because they’re old and I haven’t used them in a looooooong time. I think I’ve had the two containers of garlic powder for 15 years now – gotta go! Many TV chefs have led the way in using fresh vs. dried herbs. More recent recipes call for fresh herbs instead of dried. Because of this trend more types of fresh herbs are readily available in the produce section of your grocery stores. With my weekly CSA share, I always receive one or two fresh herbs and these are even better as they were picked that day. To my taste buds, using fresh herbs makes a significant improvement in what I’m cooking. I love to stuff the cavity of a chicken I’m about to roast with a big handful of fresh thyme or rosemary. This perfumes the meat of chicken beautifully with the earthy and delish flavors of the herb. The aroma of fresh basil in the kitchen always makes me smile. And using it in my cooking makes my taste buds sing. Of course in a pinch, I’ll use dried herbs if I must, especially if I can’t find fresh herbs in the store. To avoid this, I’ve started growing my own herbs. Admittedly I’m not the best gardener around but I find it quite easy to keep a few flowerpots with basil, thyme, chives, rosemary, cilantro and parsley in the back yard. I feel such a sense of accomplishment when I can go out back and snip off some fresh herbs for my cooking. And it’s so convenient too! Of course, as with most things, I have an exception. I have also grown fresh oregano but I find it to be so strong fresh that I prefer the dried herb in this one case. Everyone has their own taste preferences and for me, I have found dried oregano works better. One of the challenges I had when I first started using fresh herbs was converting my older recipes that called for dried herbs. I have included some tips below to help you if you’d prefer to make the switch. 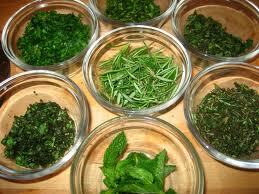 Dried herbs are more potent than fresh as the dried leaves have shrunk into smaller pieces concentrating their flavor. I use a ratio of 1 (dried) to 3 (fresh) when substituting. So if you recipe calls for 1 tablespoon of fresh chopped rosemary and you only have dried, use 1 teaspoon of dried rosemary. (1 Tablespoon = 3 teaspoons) Or if you have a recipe calling for ½ a teaspoon of dried basil, use 1½ teaspoons of fresh basil. The 1:3 ratio is a general rule of thumb but you should let your taste buds guide you too. Always taste your food and make any adjustments to seasoning. Generally when you use dried herbs, add them early in the cooking of the dish. Rubbing them in your hands as you add them activates the oils and helps bring out the flavor. I like to add dried herbs to the oil if I’m sautéing onion and garlic in the beginning of the recipe as the oil or butter can help to rehydrate them and get more flavor out of them. When using fresh herbs, add them in the middle or towards the end of cooking as the flavor will release more quickly and you don’t want to cook the flavor out of your dish. Some herbs can become bitter if you cook them too long. Hope these tips help. You will make a significant improvement in your cooking when you start using fresh herbs. People often ask me, “What did you put in this? It tastes so good!” One of the main reasons – I use fresh herbs and the freshest ingredients I can find.